July | 2009 | that's what summer said. My dad was in town last night. Whenever we’re in the same room, I usually get filled with this anxiety because my apartment is a mess, or my car, or I’ve not done some things I should’ve or I’ve done things that I shouldn’t. This time was a little different. He lost his job a few weeks ago, and it’s been really hard on him, esp since this came only a week after my grandmother (his mom) passed away. Today he was traveling to Montgomery to take some tests, and it was just easier for him to leave from my place in Birmingham. When he arrived, we chatted for a bit and then decided to head to dinner—IHOP, his favorite. We had some nice conversations, and it’s times like this that I think, “Wow, when did I become grown-up enough to have adult conversations with my dad?” We talked about work and life in general, and my anxieties about getting up and facing the day. I’m having a lot of trouble doing that. I’ve gotten into this mentality that my life is a giant hourglass, and the grains of sand are passing through much too quickly, while meanwhile, I’m just drowning in them. I feel like I’ve got nothing to be proud of it, like things are just happening around me and time is moving way too fast. Like I’m going to die soon, and it’ll all just be over. Why can’t we live forever? Anyway, moving past my existential crisis…we came home from dinner (after stopping to get a gas station cappuccino, another of my dad’s favorite treats) and strapped on our tennis shoes to squeeze in a quick walk around my neighborhood. 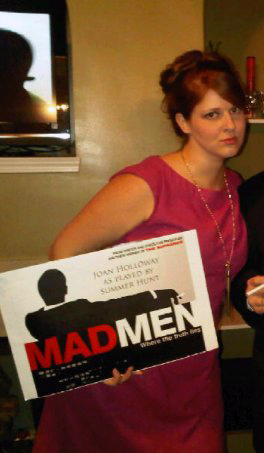 My dad told me that he had been terrified to turn 30. When I asked him why, he said simply, “Because I wasn’t ready to let go…of my 20s, of being young.” At that point in his life, my dad was married, had one kid, and was making a pretty decent living at the steel mill in Gadsden. But he still felt that way. That gives me some comfort. So…I have a habit of sometimes taking pictures of the foods I’m eating. Then I never do anything with them. I’ve decided it’s time to take advantage of my food photos in a blog. I made a soup a few nights ago, with the aid of a few recipes but mostly what was in my head. I need a little guidance on how to prepare everything. 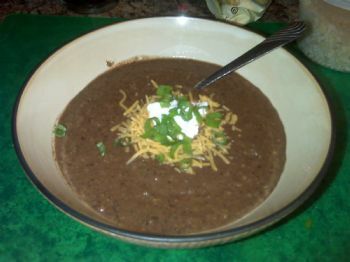 What resulted was a spicy black bean soup. It’s probably going to need some tweaking, mainly in the spice department, and it’s probably going to need to be thinned out with some broth or water (if you’re cheap, like me). It was pretty delicious, and I ended up freezing the leftovers in half-cup portions. I’ll list the recipe at the bottom, if anyone is interested. The stats are pretty decent, esp considering I added no fat or anything, other than the 2 tbsp of veggie oil to sauté with. And that’s divided amongst 5.5 cups. Here, I sautéed the bell pepper, onion, and garlic. 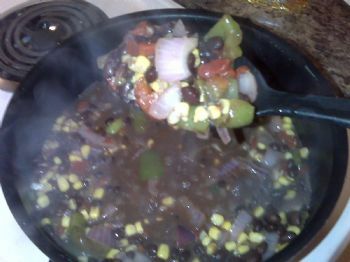 This was followed by the addition of Rotel, corn, and black beans. I had this with a grilled cheese. It was YUMMY. 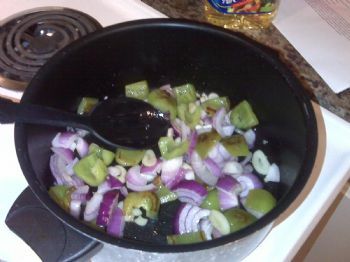 Using a large pot or dutch oven, saute bell pepper, onion, and garlic in vegetable oil until tender, about 5 minutes. 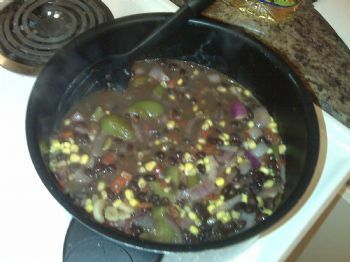 Add corn (drained), Rotel and black beans. Season with chili powder and cumin, to taste. Bring to a boil, then bring temp back down to low to simmer and let flavors blend, about 15 minutes. In small batches (about three cups each), puree soup in blender (or use an immersion blender in pot). Serve hot, topped with sour cream, cheese, and green onions if you like (not in nutrition). My recipe made 5.5 cups of soup, it may vary. The info is for a 1/2 c serving. I didn’t use any broth or water to thin it out during cooking, though, and you might want to do that. I’ve been adding a little water after cooking to stretch out the amount; it does very little to the flavor.